is it available on trunk ? Yes, at this point we still need to resolve some minor issues and simplify deployment, but the code is on svn trunk, under drools-process/drools-gwt-*. But this is only the backend implementation that links the console to Drools Flow. 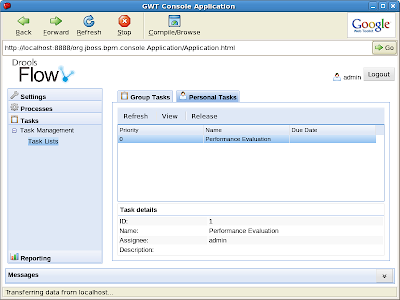 The gwt-console itself can be found here. 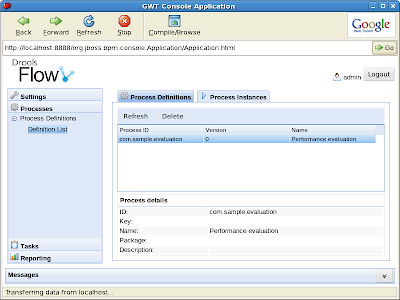 FYI, I've just released 1.0.0.CR1 of the gwt-console. Could you also post some high level deploy (packaging) notes? How to package the drools-gwt-console,-form,-graph jars, with respect to the gwt-console-server and gwt-console-server-integration modules ? 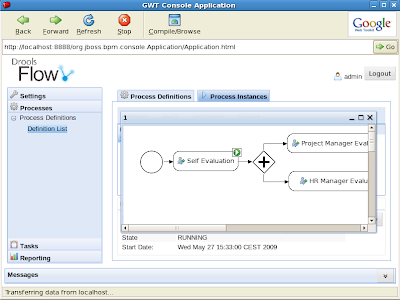 I am trying to run gwt-console but I'm having some errors. 1. Deploy a process to default package in Guvnor. 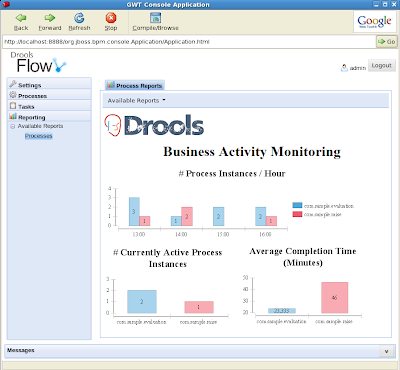 Process has been built and a snapshot created. I can successfully add the package through a test class from eclipse by executing kbuilder.add( resourceFactory.newUrlResource("http://localhost:8080/drools-guvnor/org.drools.guvnor.Guvnor/package/default/LATEST"), ResourceType.PKG ); And process runs and completes without any errors. a. Created a data source called testDS1-ds.xml and placed it "jboss-4.2.3.GA\server\default\deploy"
b. Copied H2 database driver h2-1.0.77.jar to "jboss-4.2.3.GA\server\default\lib"
c. Copied gwt-console-rpc.jar to "jboss-4.2.3.GA\server\default\lib" folder. 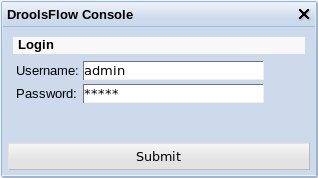 d. Copied gwt-console-server-integration.jar to "jboss-4.2.3.GA\server\default\lib" folder. e. Installed Birt reporting engine 2.5.2 by copying ReportEngine folder to "jboss-4.2.3.GA\server\default\data\birt" directory. f. Copied H2 database driver h2-1.0.77.jar to the ReportEngine "jboss-4.2.3.GA\server\default\data\birt\ReportEngine\plugins\org.eclipse.birt.report.data.oda.jdbc_2.5.2.v20100205"
g. Copied gwt-console-server-drools-5.1.0.M1.war to "jboss-4.2.3.GA\server\default\deploy"
h. Copied gwt-console-drools-5.1.0.M1.war to "jboss-4.2.3.GA\server\default\deploy"
- There are some error logs in jboss log right from the go when staring up. No stack trace but logs with ERROR level. - When I click Processes >> Process List >> Processes I can't see my process and Jboss logs a stack trace. - I also noticed that ProcessEngine plugin does NOT check out green. Am I missing something? Do I wrong versions of jars? Error logs and Stack trace are to long to include here. Let me know if I can get those to you some other way. please provide the svn link gwt-console.